I hope that you and your family had a wonderful Thanksgiving! We had a lot to be Thankful this year...such amazing wonderful children that God has blessed us with! Here is a list of super fun activities and songs that you can do with your children right before Thanksgiving! I have blogged a lot about Andrew and his severe food allergies that he suffers from. It is tough for a little guy like him. Recently he was also diagnosed with Eosinophilic Esophagitis. A disease where the allergen's are attacking his esophagus causing permanent damage. We have been long term supported of FAAN, ever since Andrew had his first Anaphylaxis reaction. Andrew really wanted to participate in their walk for a cure and find some other children who suffer like him. Andrew raised over $2,000 for a cure and brought out his entire family to support him in this walk. For more information and to find a walk near you, please visit www.foodallergywalk.org. Everyone had "team Andrew" shirts on! Look at all the people who came out to support this great cause! Team Andrew! Fighting for a cure! I was emailed this cute picture from my Father-in-law this afternoon. 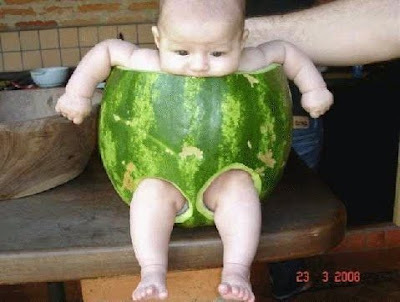 It's a picture where someone made a high chair out of a watermelon. I could not help but share it with you all! Enjoy! We are beginning to launch a new blog!! This blog is only going to have children's songs & activities on it!! It is sure to be a blast!! We hope that you stop by visit and follow us there!! We will still be posting here too!! So grab your children, paints and brushes and come on over!! This week we are featuring all new recipes for your children!! Yeah!! Today over 1.4 million men and women serve in the U.S. armed forces and over 24 million veterans have served in the past. The holiday season is the perfect time to honor and extend a warm holiday greeting to those who’ve served and continue to do so. They have established an extensive process to ensure all cards sent to our service members are safe and arrive in time for the holidays. Holiday cards will be collected through a unique P.O. Box address from Monday, November 2 through Monday, December 7*. Every card received will be screened for hazardous materials by Pitney Bowes and distributed to participating Red Cross chapters nationwide. Once the cards arrive at the Red Cross chapters, they are sorted and reviewed by volunteers who then distribute them to service members, their families and veterans in communities across the country. Please don’t forget to follow these guidelines while preparing your holiday greetings! Please make sure and spread the word about this wonderful program with your friends, families, teachers, blogs and Twitter!! the farmers and their family had contracted it and many died. in her shop. To her surprise, none of her staff got sick. It must work..
last year and we never got the flu. If this helps you and your loved ones from getting sick, all the better. If you do get the flu, it just might be a mild case.. 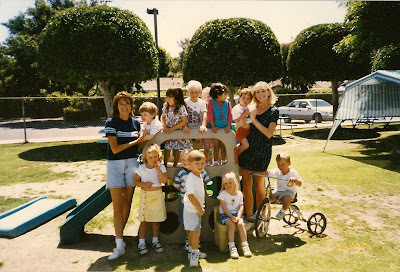 I recently came across this photo from almost 14 years ago when I first started teaching preschool!! I was the blonde teacher and can't believe how short my dress was! !